There is something here for everyone. Hillary Clinton was and is so corrupt few of us can remember it all. Some of us are too young or were to busy so some of this information, to varying degrees, will come as a revelation... even if you think you know much of her high crimes and misdemeanors. One thing is for certain, Hillary Clinton must not become President; she may just be more fierce than Barack Hussein Obama. It is still hard for me to conceive that a large portion of the American electorate still supports her for any office, much less the Presidency....and doesn't demand her immediate arrest. 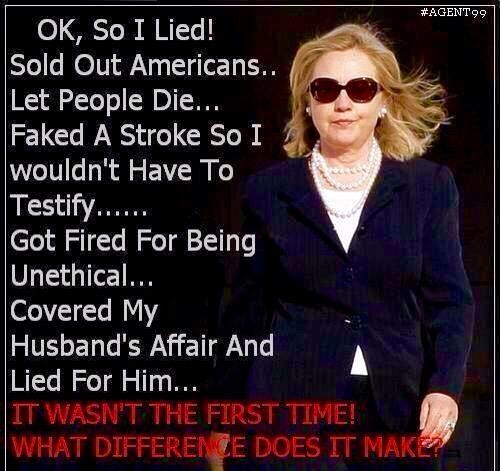 How far we have fallen to support such a dishonest and lost individual for the highest office of the land. Heaven help us. Please consider sharing the video below.